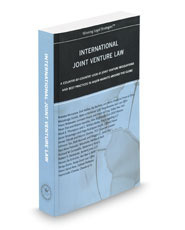 International Joint Venture Law takes a country-by-country look at joint venture regulations and best practices in major markets around the globe. It discusses important elements of joint ventures and other types of cross-border transactions in various countries, from practical information on court proceedings and document disclosure to larger strategies for negotiating and closing a deal. It provides practical information for foreign businesses on the current legal environment, relevant case law, and standard business practices.